It's good for keeping track of your kids too. If you've ever tried to find your friends at a music festival, you know how terrible cell phones can be at tracking them down. Even if you could hear what they're saying over the noisy crowd, you'd still have a hell of a time trying to figure out just which tree they're next to, or exactly what kind of red t-shirt they're wearing. Apps like Find My Friends or Google Maps won't do much good in this scenario either. Thankfully, there's a solution. 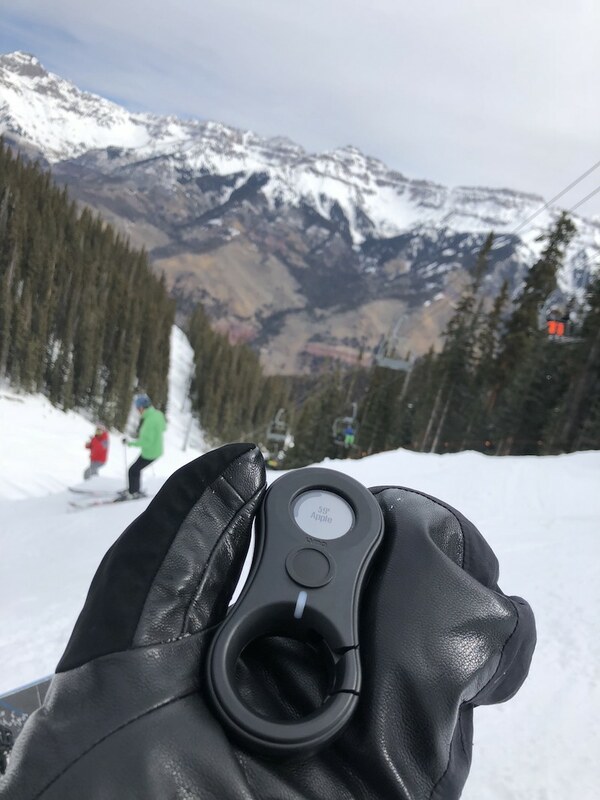 Enter LynQ, a handy little device that'll not only help you locate your friends and family in the great outdoors, but it might even save lives. It's already well-publicized at this point, but it hasn't actually come to market yet. Until today. It's available now on Indiegogo with an early-bird pricing of $154 for a 2-pack. The idea is pretty simple. You give each person in your group a LynQ (you can have up to 12 in a group), pair them with each other, and you'll now always be able to know how far each person is away from you, and in which direction. The pairing is done pretty easily too -- just put them all next to each other, select a group size, and they'll automatically create their own unique long range low power radio network. From there, the devices pull their location from GPS and send coordinates to each other utilizing a proprietary radio protocol. It's, in effect, a private closed network just for you and your loved ones. On the face of the device is an e-Ink screen, which consumes far less battery than a traditional LCD. It only has one button, with which you either quick or long press in order to navigate through the menu. LynQ says this is to keep the device simple, but it does mean it had to be creative when designing a way to enter in names without a traditional alphanumeric keyboard. To do so, you'd essentially rotate the device around, using the accelerometer to align the arrow with your chosen letter. Press the button to select, and repeat. Pretty clever. When ready to go, it'll show you your friend's name, their distance in kilometers, miles or number of feet and then a darkened line that acts as the arrow. The arrow will move in the direction of your friend, and the closer you get to them, the wider that arrow will get. It has a range of up to three miles, a battery life of up to three days on a single charge and it's military-certified to withstand the elements. And because it uses GPS and a low-power radio network, it doesn't require a subscription and it can work globally right out of the box. 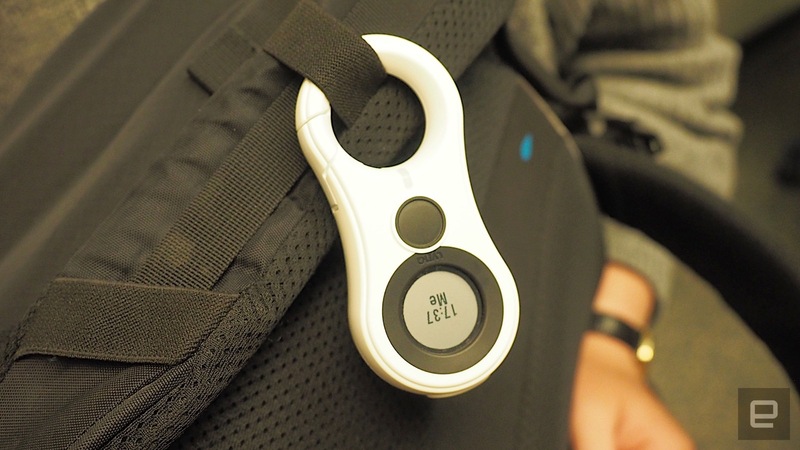 Co-founder Matthew Misbin says that the idea with the LynQ is to wear it on the outside of your person, whether it's on a belt loop or your backpack. "It allows you to quickly reference the device," he said. "It gives you exactly the piece of information you want." In addition to letting you know where your friends are, you can also use the LynQ to send canned messages, like "Stay there" or "Come to me." If you're within a certain distance of someone, you can set it so that it sends a message like "Hey I'm near you" or "Hey I'm looking for you." But more than just finding your friends in a crowd, LynQ could also be used for keeping track of kids. You could, for example set up a custom safe zone, so that the LynQ will sound an alarm if your child wanders off beyond a certain distance. Drew Lauter, LynQ's Chief Operations Officer, tells a story of a recent family trip to the beach, where he set up the safe zone right up to the water's edge, and when his daughter went beyond that line, his LynQ started vibrating, beeping and blinking with tremendous urgency. Additionally, the LynQ's screen will also immediately flip direction to that person, showing you the direction and the distance the person went. You can set a "homebase" to act as a gathering spot for everyone as well. According to LynQ CEO Dave Shor, the device could also be used for taking care of grandparents with dementia, or with special needs kids. It could help caregivers keep track of children with autism, for example, who might get seriously injured if they wander off by themselves. But one particular interesting use case is with search and rescue or disaster relief. The US Pacific Command used LynQ devices in a 2017 joint exercise with the Thai government to see if it would help them recover wounded soldiers. And according to tests, it reduced the time spent by 61 percent. Because of this, LynQ is in discussions to provide direct sales to emergency responders. "We never really thought it would be used this way," said Shor. "But it makes sense. It's ten times easier than a radio or a phone, and if you're wounded or disabled, you couldn't respond anyway." That said, the LynQ only really works if you're outside. If you get lost in a shopping mall, for example, you're out of luck. This is due to the limitations of GPS, but also LynQ's desire to be off the grid. "Indoor locations typically rely on infrastructure and using WiFi," said Lauter. Still, he didn't rule out the possibility of LynQ adding that indoor tracking some day. The other downside is that the LynQ isn't cheap. Once the early-bird pricing is over, it'll retail for $249 for a pack of two, and if you want more than that, the cost can add up. Sure, the lack of a subscription fee helps, and it does offer several perks over a regular cell phone, but that might not be enough to justify the cost. If you want to give it a shot anyway, you can head on over to that Indiegogo page to get that aforementioned early-bird pricing. With any luck, LynQ will start shipping this fall, which should be just in time for the holidays.